... And Ensure They're All Friends By Your Big Day!!! 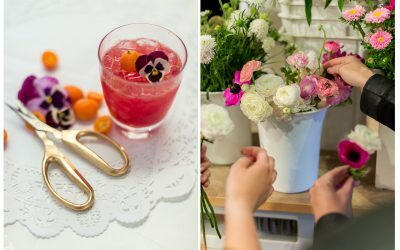 A private floral workshop at Lilla Bello is an ideal way for your friends and family to bond over gorgeous florals, cocktails, and fun! So, we already know how dear each one of your bridesmaids is to you, but the classic predicament is that they don't know one another. For example, Cindy, your fiance's sister might not know about that one epic night, sophomore year, when you and Jessica danced all night at that downtown club, and how you and Michelle had that hilarious inside joke about the day your boss had toilet paper stuck to his shoe for the better part of the day. Each experience, SO meaningful and special to you, but these gals are oftentimes fish outta water when you throw them into the melting pot of "bridesmaid zone"! What better way to get to know one another and let your hair down, then hosting a private floral workshop! Roll your sleeves up, pour a cocktail, turn on some fun tunes and get creative! Believe me, the stories will start to roll, and each of your adored 'maids will shine in her own special way, showing the rest of the ladies exactly why she's so special to you. Floral workshop may be privately booked for 8 -12 guests. Each workshop is 2-1/2 hours. Workshop categories: flower crowns, succulent terrariums or floral arranging. Each guest goes home with their creations in hand! 10% off all lifestyle shop merchandise during the workshop. Contact us to schedule yours today! *Not getting married any time soon but love the idea of a floral workshop?! These little shindigs are also perfect for Birthday Parties, Bridal Showers, Baby Showers, Girl's Night Out, Holiday Parties, and more! How about getting your gal pals together to making something pretty for Mother's Day (it's like the grown-up version of crafting mom a macaroni necklace at school... but, um, so much better!). Give us a call - we'd love to brainstorm your next get together!